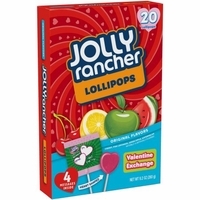 Jolly Rancher Heart Shaped Valentine Pops. A perfect Valentine candy. Each bag of heart suckers comes in 4 flavors Jolly Rancher flavors:Pink Lemonade, Cherry, Watermelon and Apple. With the bold fruity taste that Jolly Rancher is famous for. These Valentine Pops are perfect for handing out at parties as on the back of each sucker there is a place to write to and from on. Each bag of heart shaped suckers has 20 assorted flavors.